Rendering of a Predator B in RAAF markings. The RAAF is to operate a fleet of 12 to 16 General Atomics MQ-9 Reaper armed medium-altitude, long-endurance (MALE) unmanned aircraft, the federal government announced on Friday. “These new aircraft will provide enhanced firepower and intelligence, surveillance and reconnaissance support to a range of missions,” Defence Minister Christopher Pyne said in a statement. The announcement to fulfil Defence’s Project AIR 7003 requirement comes more than two years after the project achieved initial ‘Gate 0’ approval in November 2016, and some 18 months after the expected Gate 1 milestone following a renewed effort by Israeli Aircraft Industries (IAI) to pitch its Heron TP system. “Remotely-piloted aircraft allow military commanders to make more informed decisions faster whilst providing the option to conduct strike and reconnaissance operations without risking the safety of aircrew,” Minister Pyne said. 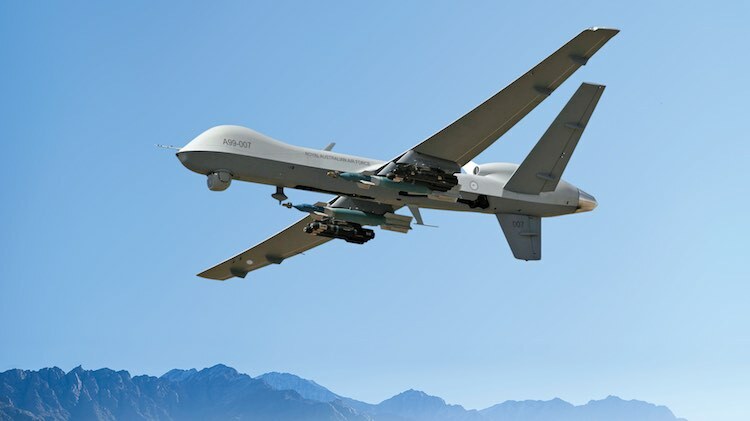 It is not clear which variant of the Reaper family the RAAF will operate, either the existing US Air Force MQ-9A Reaper or the Type-Certifiable Predator B (marketed as the SkyGuardian), which the USAF has designated as the MQ-9B. “The Government will now request pricing and availability data from the United States on Reaper variants to support future decision-making on the acquisition,” the government’s statement reads. RAAF air vehicle operators have been training and operating on exchange with USAF operational Reaper units at Creech AFB and Holloman AFB in the US since February 2015, while the Defence Integrated Investment Program that was published with the 2016 Defence White Paper first publicly outlined a plan to acquire an armed unmanned aircraft to provide an integrated and persistent intelligence, surveillance, reconnaissance and attack capability to support the Australian Defence Force and coalition forces. The Air Force has been without a MALE UAV capability since retiring the IAI Heron I in mid-2017. 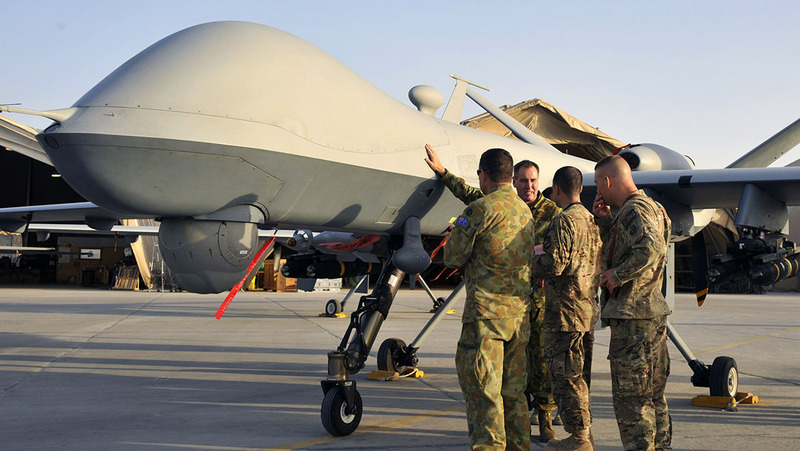 The RAAF had leased three Herons in late 2009 to meet an urgent operational requirement to provide surveillance support to Australian and coalition troops in Afghanistan, becoming the first unmanned aircraft to be operated by the RAAF (the Jinidivik target drone aside). It’s a shame the Avenger also from General Atomics wasn’t considered/selected. It can trace its lineage from the Reaper. Its weapons fit and ground station are common. The electro-optics are also common with the F-35. The MQ-9B Sky Guardian is being discussed as the likely pick (same as the UK has ordered). It can fly in all weather, can take lightning strikes and can fly in all civilian airspace. Avenger with its jet engine is a lot faster than the Predators, but with half the endurance. If they’re ever not required in a combat zone, the opportunities for humanitarian and disaster relief operations for a highly advanced reconnaissance UAV are huge. IR and optical sensors with sophisticated digital image processing technology could be tasked with finding survivors after a flood or tsunami and vectoring rescue teams to their location. Electronic Intelligence sensors could be reprogrammed to act as an airborne mobile phone tower to restore communications after a landslide or earthquake. Or during the bushfire season, IR sensors could be used to monitor high risk areas to detect fires earlier, before they become a major risk. In a true 5th generation defence force, the possibilities are endless.